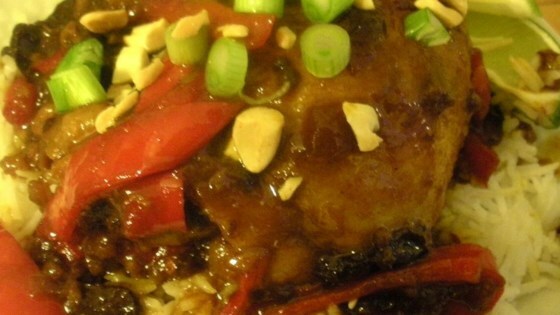 "This is an excellent dish served over a bed of rice. A great company dish. Beautiful presentation. Serve over a bed of hot cooked rice (preferably basmati) if desired." Rinse chicken and pat dry. In a large skillet heat oil until almost hot. Add chicken, skin side down. Brown chicken until lightly browned on both sides. Add curry powder, chutney and red bell pepper. Simmer 30 minutes over medium low heat. Top chicken with lime wedges, chopped scallions and peanuts. Serve immediately. Amazing taste, and amazingly easy to make. If this were from a restaurant, I'd pay a reasonable price AND come back for more. Awesome! I replaced part of the curry with cumin, and since i didn't have rice, I added frozen vegetables into the chicken when i added the red bell pepper. It's just fantastic, and healthy! An easy and delicious dinner! I added some chicken broth with the chutney just because I wanted more sauce and it turned out great! Served with flatbread. Yum! Super tasty! Fast, healthy, delicious....what more could you ask for? !